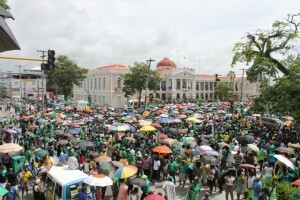 FLASH BACK: Thousands of APNU+AFC supporters thronged Parliament Building to hear and see David Granger being sworn in as President of Guyana following the May 11, 2015. A New York-based Guyanese teacher and political commentator, who has constantly predicted a People’s Progressive Party (PPP) victory, on Saturday said the incumbent David Granger-led coalition would be in power for the foreseeable future. “There is no guarantee they would return to government. It is my analysis that those in government would remain in office for decades to come,” Bisram was quoted as saying in a letter in the privately-owned Stabroek News newspaper. Minister of State, Joseph Harmon earlier this week expressed confidence that the APNU+AFC coalition would be in power well beyond 2020. “Based on how we see things and the way in which the population is now responding, we will be here beyond 2020,” said Harmon, regarded in some quarters as Guyana’s de facto Prime Minister. Against that background, Bisram called on the PPP to launch a campaign for the scrapping of the 1980 Constitution- which was promulgated out of a rigged referendum and revised in 2000- and pass one that provides for limited presidential powers and power sharing. “They should therefore oppose the constitution and call for its immediate replacement with a constitution that restricts powers of the executive and that share the government with all elected parties in proportion to the percentage of votes obtained in a free and fair election,” Bisram said. It is unclear whether his forecast about the PPP remaining out of office for several years to come was linked to the polls that he said he has been conducting over the years or other reasons. If the opinion poll he says he conducted is anything to go by, then Bisram might be suggesting that the People’s National Congress Reform-dominated government would rig the next elections. That poll, he said, finds that 63% feel the next general election will be rigged to keep the incumbent in office. Bisram’s says his poll shows the the PPP winning the 2020 general elections if it is free and fair. “The latest poll finds that if a free and fair election were to be held now and Jagdeo decides to contest, he will win the Presidency with majority support defeating the incumbent David Granger as the candidate of the APNU+AFC combine,” Bisram said earlier this month. If the general elections are free and fair, he said the poll shows that 53% of the PPP will win, 40% said the coalition and the others are unsure. “Those who enjoyed exercising the powers of the Burnham constitution since the 1992 restoration of democratic rule have not related to our struggle against a fraudulent document. The opposition fails to understand that the very powers in the constitution that they look forward to invoke are currently being used against them,” Bisram said in reference to the PPP that appears eager to use the constitutional powers. On the other hand, the PPP is banking on a number of vote-getting issues: what it says are the David Granger-led administration’s failure to keep its promises such as creating jobs for youths, substantially increasing real wages, decreasing crime, fighting public corruption, improving transparency, closure of the sugar industry and the apparent witch-hunt of PPP members and supporters with perceived trumped up corruption allegations and charges. 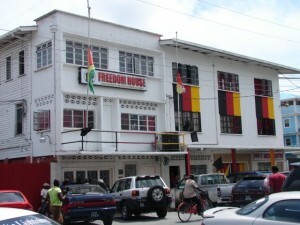 The PPP’s tenure from 1992 to 2015 had been characterised by accusations of racial discrimination against Afro-Guyanese, rampant corruption, drug-trafficking, death squads, violent crime by armed gangs (which the PPP blamed on the then opposition), mismanagement of the sugar industry and alleged violation of human rights such as freedom of expression.